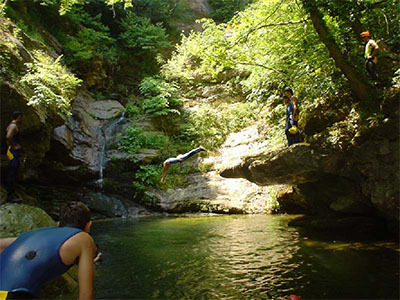 Canyoning for the many:"Kalypso" Canyon: the view of the dream-like 70m-waterfall of "Kalypso" is a magnet for every children and adult. Our guides will take you via a prompt hiking route at the base of the waterfall to swim in the biggest of its lakes and then will guide you back to the start by descending three successive waterfalls 25-35m. It includes: All necessary technical equipment, experienced Guides, local transfers, picnic, insurance.